Sudden cardiac arrest is the number one cause of death in the world. According to the World Health Organisation, two-thirds of deaths are due to heart failure and most occur at the workplace. A cardiac arrest can happen anywhere at anytime, and we cannot predict or prevent it. The real issue is what can we do while the patient is struggling for air and for life, and when the ambulance is on its way. We must help, of course! There are certain techniques and ways to help. We must ensure that before something like this happens, we are ready, as much as we can be for something like this. Death usually occurs within minutes, unless we restore a normal heartbeat fast. We use the technique known as defibrillation. We have all seen it on TV and documentaries. They use a machine called an Automated External Defibrillator or AED. As recommended by WHS legislation, every workplace in Australia should have fast and prompt access to an Automated External Defibrillator. Employee’s health and safety come first. By installing these in the workplace, in public places and having them close at hand, we can act immediately should a medical emergency arise and it will save lives. This HeartSine Samaritan AED 350P automated external defibrillator can be installed anywhere, can transported without any problems and can also be used without prior training. What Happens When You Use an AED Defibrillator on a Person Whose Having a Cardiac Arrest? First, lets see what a cardiac arrest is. The heart ceases to pump blood and the blood flow to the brain and other organs ceases. There is no oxygen, without which our organs cannot function at all. A lack of oxygen supply to the brain can have catastrophic consequences. After three minutes of cardiac arrest, the brain suffers permanent and irreversible damage and after five minutes death occurs. The patient is often revived by an external compression of the heart, called CPR. That is why it is important to react quickly. The chances of saving a life significantly improves by having access to an automatic external defibrillator (AED), which anyone can use. 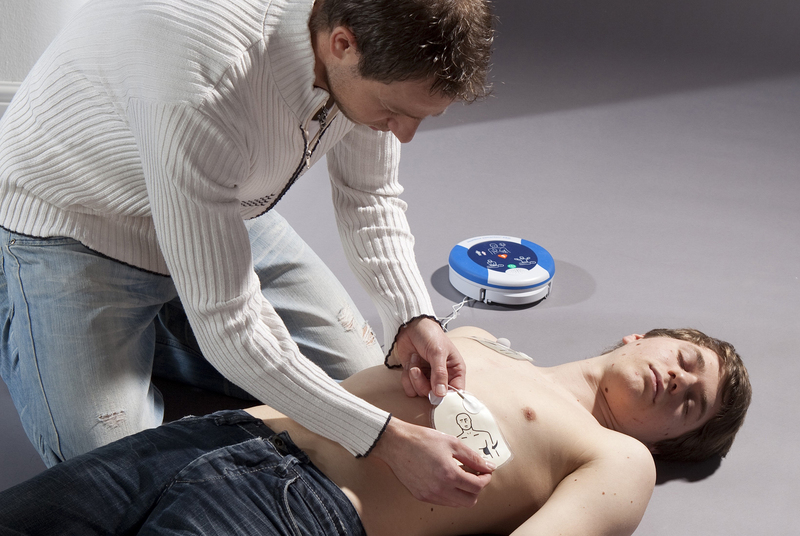 Namely, AEDs are easy to use as the defibrillator itself measures the heart rate. Then, these AED machines give instructions to the rescuer (in voice, in the desired language) and enable defibrillation. They are completely safe because the device will not allow defibrillation unless it is 100% sure that it is the only thing that can save the patients life. So, using an AED can only help, and in no way can it harm. Many people have heard and know what an Automated External Defibrillator (AED) is, but many of them do not know how it works. The application of HeartSine Samaritan AED 350P AED (automatic external defibrillator) on the patient is very simple. Even without prior knowledge, everyone can use it by simply following the pictures and voice commands. The first thing one needs to do is to lay the patient down on the floor or ground and to open the AED kit. When you open the kit and turn it on, the AED will automatically identify whether you are an adult or paediatric patient. Afterwards, you need to pull out the green tab, then remove the pads and place them on the chest as per the photos, found on the pads. After that, you should listen carefully and follow the voice instructions that the device gives you. The life saving Samaritan AED 350P will check the heart rhythm of the patient and, give detailed and precise instructions. If it is necessary to give artificial respiration and to massage the heart, the AED will monitor how the person is performing the revival. It will use voice instructions to correct the depth and frequency of the massage if necessary. This will ensure the massage is effective. How Does an AED Affect the Heart? When a person is having a cardiac arrest, his or her heart goes into sleep mode. Using a defibrillator will wake it up, revive it and bring back a pulse. Once it has analysed the pace of the heart, the machine will determine if a shock is needed. If a shock is required, the electrical current (typically 150 Joules of Energy for adults and 50 for children) will defib the heart rhythm and bring it back to a normal beat. With CPR we use our hand to push the heart into a normal rhythm and to pump the blood. With electric shocks, we restart it, which is more effective. How Can an AED Save a Life? By having an AED on hand, for instance at our workplace, we have the potential to save many lives. As we have said before, no one can predict cardiac arrest nor prevent it, but when it happens we can react properly and instantly if we have access to a portable defibrillator. On top of other safety equipment supplies, like fire extinguishers, emergency kits, bandages, and medicines, according to the latest legislation in Australia, every workplace must have a portable defibrillator in case of an emergency. We had a truck driver on site who collapsed and required immediate and emergency treatment. We administered first aid, which included the use of our defibrillator which in the end made a huge difference to the recovery of the patient Ethan. A number of people across the site have been asking after Ethan’s recovery so I thought I would send out a quick note. Ethan had been in an induced coma and came out of this earlier this week. Darryn and Steve Gross visited Ethan yesterday and were pleased to report back that Ethan is being discharged from hospital and is able to return home. He will most likely need to wear a mini automatic defibrillator, he was very much appreciative of the Team at Huntingwood, and what was done for him. We must ensure that our work environment is prepared with safety equipment including first aid kits and an AED. We need to put them in visible and easily accessible places along with free defibrillator signs, so that employees have fast and easy access. There are many available in the market, but the big questions are which one to choose, which AED is the best and most economical, whether to buy or rent, and much more. Alsco offers a variety of first aid kits and defibrillator rentals, available for any work environment, whether it be a hotel or pharmacy or factories, construction sites and more. The Alsco rental program also includes regular training, check ups, maintenance and replacement pads so you don’t have to worry about the WHS legislation in Australia and can focus on your business instead. Alsco provides the best possible service while minimising any potential safety risks at the workplace. Prioritise safety and save lives. Call Alsco right now!